Sweet potatoes are a favorite on Thanksgiving and are a must on a traditional holiday table. To make things a little more interesting, this version won't include any gooey marshmallows. Instead, I made the following recipe with some Kentucky bourbon whiskey and candied pecans. This dish represents the south of our Regional Thanksgiving this year and as they say, a little alcohol makes a party! - Boil or bake your sweet potatoes until soft. Peel and mash until smooth. Season with salt and place in a baking dish, then cover. - Make a batch of candied pecans. You can use a portion for the dish (chopped up once cooled) and serve up the remaining pecans as an appetizer or snack, or even add to salads. - Combine the two corn syrups, maple syrup, and bourbon whiskey in a small jar or salad dressing bottle to make the sweet bourbon sauce. Store at room temp until ready to use. - Preheat the oven and pour the sweet bourbon over the mashed sweet potatoes in your baking dish. - Top with your chopped candied pecans and bake in the oven until hot. Cook sweet potatoes; peel and mash. Place the mashed sweet potatoes in a buttered casserole pan or dish. Combine the remaining ingredients except nuts and pour over potatoes. Bake at 350 degrees until bubbling hot. Garnish with nuts and serve. As a native Kentuckian, I love this twist on it! I love the idea of the candied pecans. 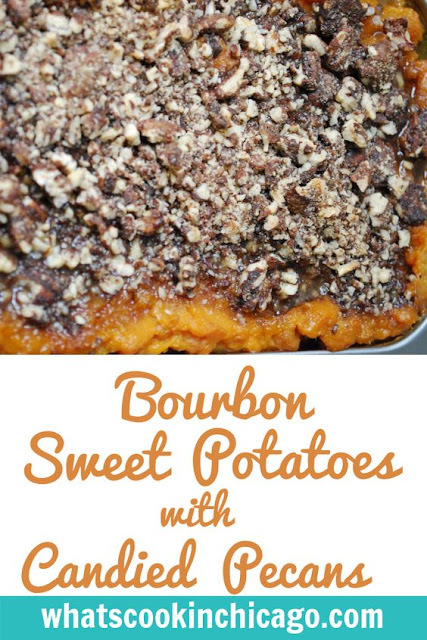 What a great mix with sweet potatoes. funny, i often make a dish like this for T-day... specifically a Bourbon-spiked, candied version. This sounds absolutely delicious! I think I might try this next Thanksgiving. Yum!